About a decade ago, when DARPA Program Manager Dr. Jan Vandenbrande was a technical fellow and senior manager of the Applied Math, Geometry, and Optimization group at Boeing, he visited an assembly line where he could examine two of his company’s iconic aircraft – the aluminum-body 777 and the 787, half of which is made of carbon-fiber-reinforced composite. Lightweight aircraft and ship structures, high-temperature jet engines, satellite mirrors and optics, and even the ceramic body armor that has saved so many of our warfighters’ lives would not exist were it not for these advances. While Vandenbrande’s comments highlight the current challenges in material science and design from the vantage point of 2018, it is easy to forget that the path to even considering load-bearing composite aircraft structures was long and arduous. It is equally easy to take for granted all of the capabilities made possible by advances in materials science over the last 50 years. Lightweight aircraft and ship structures, high-temperature jet engines, satellite mirrors and optics, and even the ceramic body armor that has saved so many of our warfighters’ lives would not exist were it not for these advances. Composites, high-strength plastics, and lightweight metals have likewise revolutionized the commercial world. More than 60 years ago, during the heart of the Cold War, such capabilities did not exist. Many in the technology community viewed materials as “the single most limiting factor on progress in military, space and nuclear system development,” according to a detailed study by Richard J. Barber Associates of DARPA’s early years. However, it was not until the job of overcoming those limitations was given to a fledgling agency with a charter for innovation that things really got going. And so began a nearly 60-year relationship between DARPA and the science community. And that relationship began in a disciplinary scrum of sorts. On July 11, 1960, just a little more than two years after it was chartered, DARPA (then ARPA) announced the creation of three interdisciplinary laboratories (IDLs) at Cornell University, the University of Pennsylvania, and Northwestern University. Over the next several years, the IDL roster would increase to a dozen universities and serve as a model for the establishment of materials programs all over the country. DARPA provided the IDLs with stable funding for research and equipment and a tolerance of – actually a demand for – an interdisciplinary approach to developing materials. With the formation of the IDLs, DARPA is widely recognized for its catalytic role in the creation of the field that became known as materials science and engineering. While DARPA handed the IDL program off to the National Science Foundation (NSF) in 1972, which changed the program’s name to the Materials Research Laboratories (MRL) program, this was only the beginning of the DARPA material science story. The concept of IPM is to use in-situ sensors to monitor a material manufacturing process as it unfolds, and to compare what you are measuring at each step with what the process models are predicting the state of the material to be. From the 1960s through the 1970s, DARPA led the charge of developing materials capabilities for defense, most often with significant support from the Department of Defense’s service laboratories – including the Naval Research Laboratory, and what are now the Army Research Laboratory and the Air Force Research Laboratory. Among the long list of materials that were becoming available for defense systems were high-temperature, nickel-based superalloys for high-performing jet engines, ceramic tank armor to combat advances in Soviet anti-armor weapons, and large, precise, stable, low-weight and low-scatter beryllium mirrors for space and missile guidance. Also included in these materials were composites of all ilks – metal matrix, ceramic matrix, carbon-carbon, and early versions of those same polymer composites in Vandenbrande’s 787. As the services increased their role in materials development, DARPA turned to a problem that emerged as a direct result of those advancing materials capabilities. The specific properties, strengths, and weaknesses of a material are derived from both its composition and the way that composition evolves into the material’s underlying microstructures during a variety of process treatments such as heating, cooling, pressing, or extruding. Processing these new, complex materials in a way that meets performance specifications at high yield with predicable properties proved to be a significant challenge. The concept of IPM is to use in-situ sensors to monitor a material manufacturing process as it unfolds, and to compare what you are measuring at each step with what the process models are predicting the state of the material to be. If there is a variation between what is measured and what is predicted, then engineers can use the process models to determine what processing parameters they need to adjust to get the process under control. 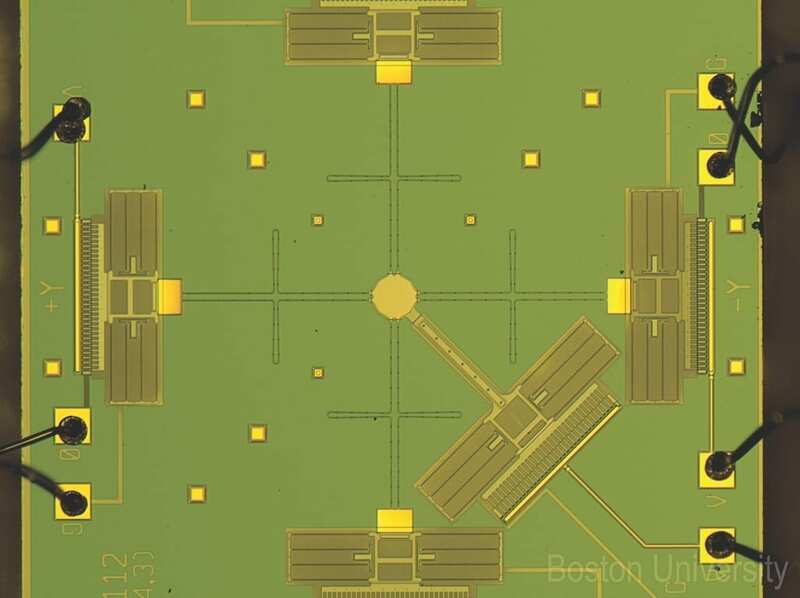 IPM was a perfect fit for DARPA, as it was enabled by a confluence of game-changing capabilities in microelectronics, computer science, and a new concept, artificial intelligence – all technologies championed by DARPA. The vision of IPM could not have been more alluring to materials scientists, who at that time still generally relied on measurements made after the process was done to determine if a material they were trying to deliver was likely to meet specifications for a given application. “The idea was not just to measure the heating cycle, pressure course, chemical environment, and other relevant variables in a materials manufacturing process, but to also sense the attributes of the material that dictated its performance for its intended application,” Wadley explained. “[IPM] has had a transformational impact upon the processing of materials. It rapidly spread and is pervasively used everywhere materials are processed – from integrated steel mills to microelectronic foundries,” he added. What’s more, Wadley noted that the practice of IPM yields a “digital twin” of a manufactured material, that is, a digital record of the specific evolving environment that brought a batch of material into existence. This is just the sort of data that researchers subsequently could summon to address weaknesses in their materials models and in the expert systems and other artificial intelligence (AI) tools that the IPM adventure revealed. IPM changed how materials were made. Even with the ascent of IPM, SFF manufacturing, and other data-reliant advances, there was so much art, artisan knowledge, and empirical trial and error in the mix that advances in materials still remained a slow-go exercise. As IPM took hold in the materials and manufacturing communities in the 1990s, it presaged how the coming Information Age would continue to drive the evolution of how materials are invented, made, and deployed. Emblematic of this phase was the emergence of solid free form (SFF) manufacturing, now known more familiarly as 3-D printing or additive manufacturing. This opened the way to forming material structures layer-by-layer and even point-by-point straight from a digital file. “The focus was on ceramic components, which were notoriously hard to prototype because they required expensive molds or machining, typically with diamond abrasives,” explained Dr. William Coblenz, a ceramic scientist and former program manager. “Only designers who absolutely needed the properties the ceramic provided, or those with negative risk aversity, would design with ceramics.” As a result, many of ceramics’ fantastic properties, among them high-heat operation and toughness, were lost on designers, who were more apt to rely on materials that were easier to work with. Even with the ascent of IPM, SFF manufacturing, and other data-reliant advances, there was so much art, artisan knowledge, and empirical trial and error in the mix that advances in materials still remained a slow-go exercise. At the same time, designers of engines, aircraft, and other systems were leveraging new computational tools to speed up their design cycle. A new engine design could take a few years, while it could take a decade or two to develop a new material to the point where engineers and designers actually would embrace it. This temporal mismatch meant that designers, unable to wait out the time it took to certify a potentially more capable new material, were constrained by the materials that were already available. Taking on the challenge, DARPA began to look into what it would take to shorten the time for insertion of a new material into a DOD application, allowing designers to be less constrained in their selection of new materials. As with IPM, DARPA enlisted the entire materials research community, including the DSRC, and from that the Accelerated Insertion of Materials (AIM) program was born. The concept of AIM was to integrate system design into the development of a new material right from the start. This new approach called for relying more on powerful assets of data, computation, and modeling and far less on the sluggish, trial-and-error process of the past. The idea behind AIM was to make the distinction between computation and experiment go away so that computational and lab experiments become interchangeable data sources. If materials engineers and manufacturers could master this exquisite degree of control over material structure, they could responsibly imagine such things as strong and featherweight aircraft made out of structural materials designed and grown to have massive amounts of empty interior space like the bones of birds. Along with work at the Department of Energy and the National Science Foundation, the AIM program led to a sea change in materials development and ultimately to the discipline of Integrated Computational Materials Engineering (ICME). “The DARPA AIM program on the acceleration of materials technology is probably the single research program with the most impact on the field,” according to Dr. Greg Olson, Walter P. Murphy Professor of Materials Science and Engineering at Northwestern University and founder of a company based on computational materials science. “I see computational materials engineering as the greatest innovation in materials since the iron swords of the Hittites,” added Olson, referring to the anomalously early accomplishment of the Hittite culture to smelt iron some 3,800 years ago – while the world was still in the Bronze Age. Follow-on work beyond the AIM program, supported by both DARPA and the Navy, helped to establish 3-D characterization and simulation techniques for materials structure. The computational and simulation tools that emerged from these efforts made for a natural fit with DARPA’s championing of Solid Freeform Fabrication in the 1990s, a precursor of today’s rapidly advancing infrastructure of additive manufacturing and 3-D printing. “The adaptation of the AIM acceleration approach to 3-D printing technology to rapidly qualify 3-D printing technology is a tremendous advance,” Olson said, referring to the parallel need to certify the usability of 3-D parts in actual systems along with the ability to make the parts in the first place. With the growing ability to use 3-D printing to combine form and functions in ways that had not been possible before, said Vandenbrande, “we have opened up the design space significantly.” This ushers in another set of challenges, of course. 3-D printing provides the possibility of engineering the properties of each volumetric pixel, or voxel, of a part. The amount of data and computation required to do that is enormous. “What we need is a new set of maths and algorithms that can describe materials and the shapes they comprise in one kind of cohesive way,” said Vandenbrande. Coming, he added, is the ability to design multiple functions – think here of aircraft skins that combine structural, sensing, cloaking, and antenna functions – in a fully integrated way. If materials engineers and manufacturers could master this exquisite degree of control over material structure, they could responsibly imagine such things as strong and featherweight aircraft made out of structural materials designed and grown to have massive amounts of empty interior space like the bones of birds. The current DARPA Atoms to Product (A2P) program, which is all about developing means for assembling nanometer- to micron-scale components into larger human-scale systems, heads in these directions. Which brings us full circle to Vandenbrande’s observations over a decade ago – and highlights the next great challenge that DARPA is taking on. Vandenbrande refers to this as solving “the inverse problem in design.” This is where the designers would first specify the performance values for a system and its parts – whether it is a missile, ground vehicle, or prosthetic limb – and hand those off to computational and modeling tools to generate multiple solutions that balance shape with the detailed material structures that could deliver the performance and functionality required by the design specifications. His current programs, Fundamental Design (FUN Design) and Transformative Design (TRADES), are developing the foundational mathematics and algorithms to initiate this vision. Vandenbrande envisions a time when computers become a true partner in design, capable of integrating advanced and emerging material architectures, to create systems currently unimaginable today – perhaps an aircraft additively built up of ultra-light micro-structures that resemble bird bones. When there is seamless integration of materials, design, and manufacturing, Vandenbrande will know that his vision has become reality.